What is it to be a stand-up comedian? To be funny, solo? You have no character-role, no double-act partner, and nowhere to look but out into the darkness, with just a microphone, an audience and your imagination. This is a job without an annual appraisal; a job where you are publicly appraised every ten seconds. The results are harsh and obvious: if the audience isn’t laughing, you ‘died’; if they can’t stop, you ‘killed’. 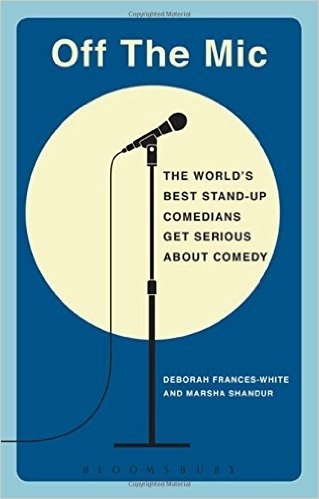 Deborah Frances-White and Marsha Shandur unpack the inner-workings of the minds of comics, sharing their secrets, insecurities and successes; their bêtes noires and their biggest fears. Featuring interviews with a host of comedians including Eddie Izzard, Moshe Kasher, Sarah Millican, Jim Jeffries, Stewart Lee, Lewis Black, Jenny Eclair, Todd Barry, Richard Herring, Marc Maron, Stephen K Amos, Rich Hall, Zoe Lyons, Marcus Brigstocke, Phill Jupitus, Gary Delaney, Mark Watson, Greg Davies and many more, this excellent book lets you in to the hearts and minds of celebrated comedians, away from the stage and off the mic. Deborah Frances-White is a stand-up comedian best known for her BBC Radio 4 show Deborah Frances-White Rolls the Dice. She’s performed comedy around the world including The Edinburgh Festival, The Melbourne International Comedy Festival and Roadshow and The London Storytelling Festival. The Improv Handbook (2008) which she co-authored with Tom Salinsky is published by Bloomsbury Methuen Drama. For more info see deborahfrances-white.com. Marsha Shandur is a Networking and Storytelling Coach and former radio presenter. Having produced the Edinburgh Festival coverage on Edinburgh’s Radio Forth, she went on to present and produce at the UK’s Xfm Radio. Whilst there, she interviewed comedians on air, and for her podcast Marsha Meets … which was named one of the World’s Top Ten Best Comedy Podcasts by the Guardian. For more info see YesYesMarsha.com.